...... effects. Photo to Video Converter Professional supports Over 260 amazing transition effects with Pan & Zoom effect. With Photo to Video Converter Professional, thousands of photos from festival days,vacationss, landscapes, wedding or family parties can now be converted to videos like mp4, flv, mov, avi, mpeg, mkv h.264 HD, 3gp, 3gpp2 and enjoyed on YouTube,Facebook,MySpace, iPod,iPad,iphone as amazing slideshows. The Photo to Video Converter's simplified three-step workflow enables users of all levels to create customizable slideshow video for sharing on YouTube, Facebook, MySpace, iPod, iPad, iphone with family, friends,customers or schoolmates. 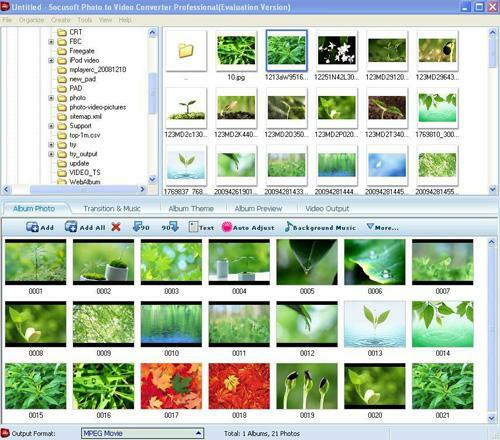 Qweas is providing links to Photo to Video Converter Professional 8.05 as a courtesy, and makes no representations regarding Photo to Video Converter Professional or any other applications or any information related thereto. Any questions, complaints or claims regarding this application Photo to Video Converter Professional 8.05 must be directed to the appropriate software vendor. You may click the publisher link of Photo to Video Converter Professional on the top of this page to get more details about the vendor.